Today's distribution centers provide far more than just short-term storage and cross-docking. By locating closer to urban areas, leveraging technology, and adding amenities to attract skilled workers, DCs are morphing to accommodate e-commerce demands and rapid delivery expectations. As businesses strive to accommodate customers' expectations for ever-faster delivery times, many are focusing on enhancing and improving their distribution centers (DCs). "I see distribution centers taking on a more critical role," says Tracie Longpre, vice president, supply chain with Applied Industrial Technologies,a Cleveland-based distributor of MRO supplies, tools, and industrial equipment. "Industrial consumers have become conditioned to want only what they need, exactly when they need it." To meet this expectation, products have to be stationed closer to the customer. "Applied Industrial continues to expand the breadth of products in its distribution centers, and to process product through DCs more rapidly," Longpre says. That includes daily overnight deliveries from the DCs to local service centers. Companies with DCs that can move a greater range of products quickly and cost-effectively "can create a competitive advantage," says Mike Marks, managing partner with Indian River Consulting Group. "They can make more profit at the same selling price." In some metro areas, it's not unusual for delivery trucks to park for hours outside a single apartment or office building while the driver delivers packages. That ties up streets and alleyways. "Rethinking how to use the load/unload space is now necessary," says Barbara Ivanov, chief operating officer with the Supply Chain Transportation and Logistics Center at the University of Washington. Ivanov is working with the city of Seattle to design a common locker system—essentially a tiny distribution center—where a delivery truck pulls up and unload its packages into separate, secure lockers. The recipients would receive an alert and have a set amount of time to retrieve their packages. Early next year, Ivanov and her team plan to test common lockers within an eight-block area of Seattle. Previous testing has shown a locker can cut more than three-quarters of the time a delivery person otherwise would spend in a building. 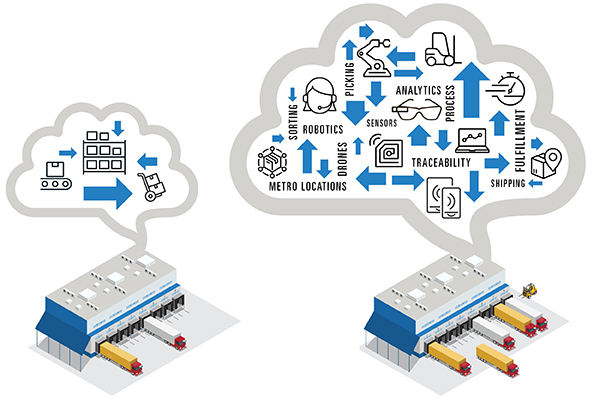 Some companies are thinking outside the distribution center when working to deliver products to customers quickly. For instance, electric bikes now power some of UPS's brown delivery vehicles. In the United States, UPS has launched eBike programs in Pittsburgh and Seattle; worldwide, about 30 programs are up and running, says Kristen Petrella, a UPS sustainability spokesperson. Trailers and containers loaded with packages are attached to the pedal-assisted eBikes, which travel sidewalks and bike lanes. Each eBike can hold up to 40 packages. To start their journeys, the eBike containers are attached to traditional UPS delivery trucks and then dropped off in a city center. Cyclists secure a container to their eBike, make deliveries, return the container when done, and attach the next container with packages ready for delivery. The same guarantees regarding package delivery apply whether packages are delivered via a cargo eBike or delivery truck. "We're finding interest for projects like this in cities across the country," Petrella says.